PDFImageExtractor is a simple program that can extract all images on a PDF document. Sometimes, we don't want to convert PDF pages to image files. We only want to take all images from each page. In this scenario, PDFImageExtractor is useful. It is easy to use. 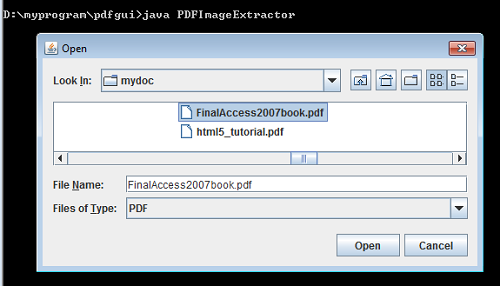 When the program runs, its allows you select a PDF file that contains images to be extracted out. The extracted image files are stored in your current working directory. In the example code above, the getPdfObject(int index) is used to extract an object from the pdf document at the specified index. To determine whether the object is an image, you need to get the type of the object by using the get method of the stream created from the object. Learned to extract all images on a PDF document and convert Adobe PDF file.